With temperatures hovering in the mid-90s and a record-setting heat index blanketing the Twin Cities, Minnesotans who normally spend every waking summer moment at one of their 10,000 lakes are scrambling to take air-conditioned cover from the intense July heat. Not Natalie Darwitz. It’s the ideal weather for cruising around Prior Lake in her new 20-foot Malibu ski boat. The sleek vessel is one of her most prized possessions because it not only gives her the freedom to experience summer to the fullest, it serves as a reminder of all the years of hard work she has put into getting where she is today. After each of her three Olympic runs, Darwitz has rewarded herself for the years of hard work and sacrifice that are associated with being a member of the U.S. Women’s Olympic Team. 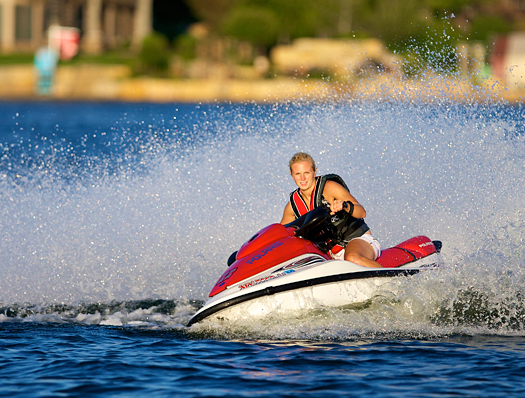 First it was a jet ski, then a Springer Spaniel named Oakley, and finally the boat of her dreams. From an early age, the summer months have always been Darwitz’s time to cool her heels away from the rink and enjoy other fun summertime activities. was also an accomplished softball player in her hometown of Eagan, Minn.
That’s why she shakes her head in disbelief when she hears of parents who push their kids to play hockey year round for fear of falling behind the competition. She firmly believes that the time she spent away from the rink made her a better hockey player. Lately, Darwitz has been on a hockey hiatus to heal a left wrist injury that has hampered her since the lead up to the Vancouver Olympics. Rather that risk missing her third Games, she opted to bite the bullet and play through the pain and the frustration that came from losing power on her shot that has netted 113 goals in international competition. when I was 100 percent,” says the captain of the 2010 U.S. squad. “There were a couple of times when my shot didn’t have the same zip on it. I said that this is the new normal for me and I just had to deal with it and dig deeper. She knows that all she can do is to wait and be patient, something she admits she’s not very good at, for the strength to return. In the meantime, playing the waiting game has given Darwitz time to pause and wonder what’s the next step in what has been a storied career. Two of her best friends, Krissy Wendell and Kelly Stephens, are now married and starting families, leaving Darwitz to wonder if she is willing to put her future plans on hold for one more kick at the Olympic can. Natalie Darwitz is still recovering from surgery to repair her injured left wrist that hampered her throughout the lead up to the 2010 Olympic Winter Games. After missing several U.S Women’s Team camps over the summer, Darwitz knows that if she’s going to play, she’ll have to ante in her chips fairly quickly to get ready mentally and physically for the long march toward Sochi, Russia in 2014. “I probably have to make my decision pretty soon,” Darwitz says. “The more time I spend away from the team and away from the game the harder it will be to go back. To keep those fires burning, Darwitz not only runs her own hockey schools but also spent the past several seasons as an assistant coach with the Gophers. She was looking forward to returning for another season when Lakeville South, a local high school in the Twin Cities, made her an offer she couldn’t refuse. Her time away from the game has given Natalie Darwitz more time to spend with Oakley, her Springer Spaniel. Like her father Scott, who taught her the game, coaching is in her blood. And being the beneficiary of so many top coaches throughout her career, Darwitz feels at home giving back to the game, sharing some of the hockey knowledge she’s compiled along the way. The time away has also given her a chance to think about how far she has come from her strides on the ice as a 5-year-old. Seemingly overnight she went from the future of the women’s game as the youngest player to ever suit up for the U.S. Women’s National Team to one who captained the silver-medal winning squad. 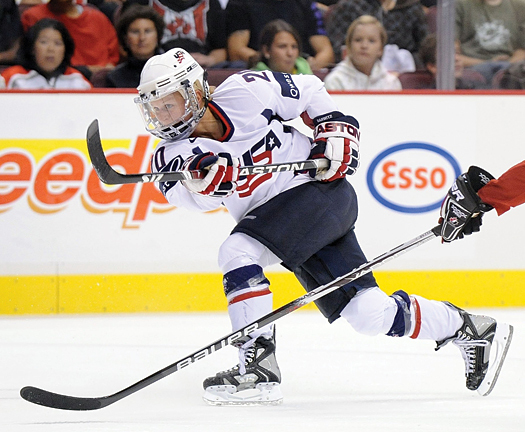 Along the way she has won three Olympic medals and three IIHF Women’s World Championships. ways, one of the greatest hockey careers in USA Hockey history must feel the same way. There will always be time to recall all the goals scored, the championship trophies held high at center ice and the deep friendships made along the way. For now Darwitz is enjoying life on the lake.